Lighting a first dance shot is always a challenge as sometimes the dance-floor is so bright with house lights it is difficult to create the right atmosphere, the other end of the scale is here at Stoke Park Club where the dance-floor was so dark my cameras were struggling to hold focus. I used a slightly different technique to usual and used remotely triggered flashguns on lighting stands and the camera stopped down to f9 to create the starburst effect you see here both from my own speedlight flashgun and also from one of the guests who pressed the shutter on their compact camera at exactly the same split second as I did creating a second smaller sunburst over the grooms head. 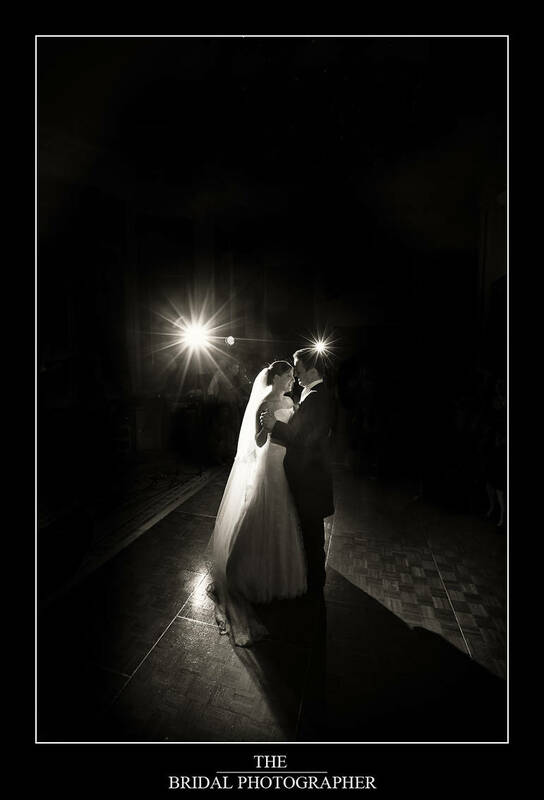 The bride and groom were lit from the front with a hand-held tungsten video light creating the fill light for their faces. All in all quite a technical shot but I really love this timeless image.